Lavalier wireless system for presenters. New for 2017, the Nady DW-11/22 Digital Microphone Systems have the superior sound quality of digital audio technology in an easy-to-use and cost-effective package. The DW-11 is loaded with top professional operating features like; 48 kHz / 24-bit digital audio conversion, low latency, and clear channel operation in the UHF 900MHz band providing interference-free performance for any application. 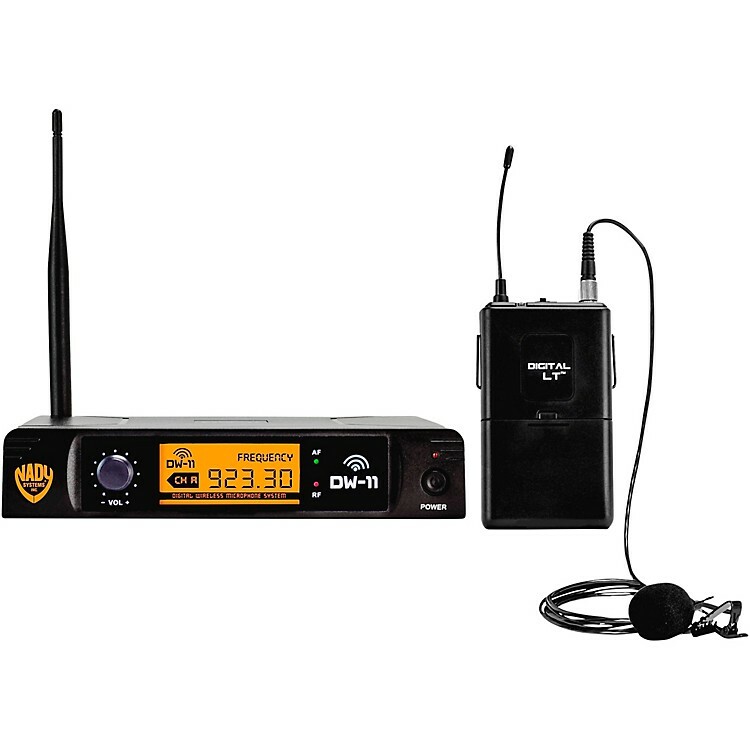 This is the cavalier version, which comes with lavalier microphone and belt pack transmitter, along with a tabletop receiver.  State-of-the art, professional 48kHz / 24-bit digital conversion for exceptional audio clarity with transparent frequency response across the entire audible range (20Hz ~ 20kHz). The truest possible sound with undetectably low latency.  Perfect for stage performance, karaoke, public address (presentations, classes, conferences). obstacles. Extended operating range up to 300 feet line-of-sight. Reliable, good quality cavalier wireless in an affordable package.